Jake Park. His thickness never lets me down. Dwight is the man. Dwight forever. Lone wolf gen jockey here. The new cosmetics don't hurt either adding g to some good stuff she already had. Meg because of her cosmetics. My two mains are Meg and Claudette. I started to play more Dwight now though. I think I am gonna go with Dwight. Basically all the female survivors. Preferably Meg and Claudette. Kate's my favorite, though I like a lot of the survivors. Recently Tapp and Dwight. Among the female survivors I rotate Feng, Claudette, and Nea. Lone wolf gen jockey playing towards stealth. So is Min. Claudette, she is so cute! Claudette too @Chi us claudette mains gotta stick together most killers on this forum hate us. I find immersion to be boring though. Now I don’t main Claudette but I don’t use blendette either but most every Claudette I see uses blendette. It's dumb. I like to play the character to have fun and not blend. I try to change peoples opinion on her. @Poweas I’ll never understand people using blendette, up against good killers it won’t work anyway, just wear what you like and you’ll be happier. I am wearing the new cosmetic for her, I usually combine these with something else, but the full outfit is just freaking great on her! For now on Claudette I use her P3 head with the white sweater and burgundy skirt. Nea, her personality seems perfectly fits for me. Aw nice. Yours looks way better than mine. 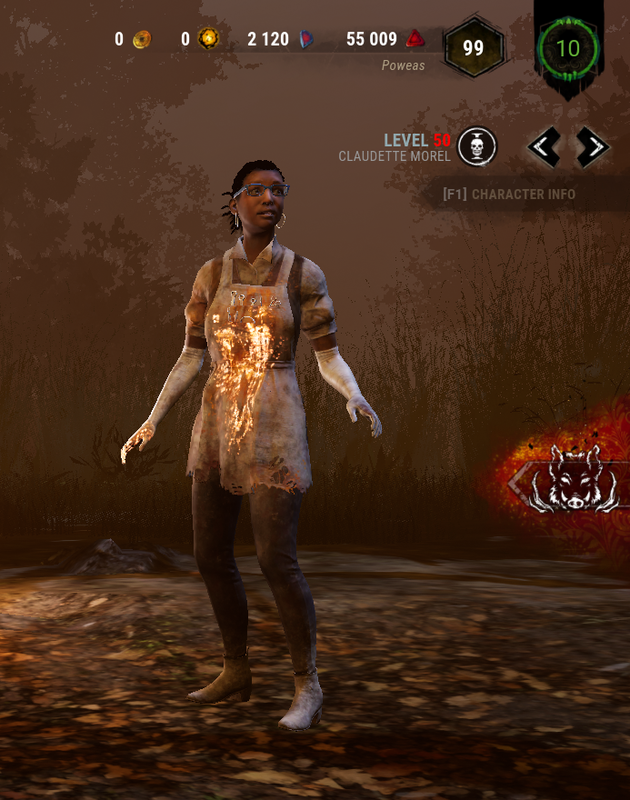 Your Claudette is cute as well! I wore that exact outfit a bit ago, before the new cosmetic came out. Yeah the mean streets Claudette looks good. But ty.